"I don't mind the circus atmosphere, because I can't control it ... Ultimately, we'll be measured by our ability to win football games. That's what this is about. This is a distraction if we lose, if we don't it's not. I'm committed to making sure that it's not, as I'm sure everyone else is," Tomlin said. Wise words from a coach who has seen and done a lot in his three-year tenure as Steeler coach. And to be honest, he hit the nail on the head. This is not his first rodeo; practically every day is a circus in the world of the Pittsburgh Steelers, and if it's not one controversy on or off the field, it's another. 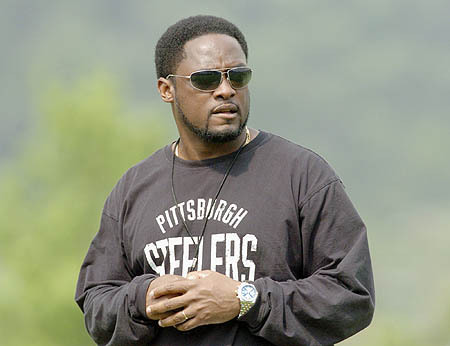 Say what you want about Tomlin, but the guy realizes what his job is. Personally, I don't know how he handles 53 egos mostly run amok on a daily basis, and unlike some, I give Tomlin absolute credit for winning a Super Bowl under those circumstances. Some folks like to discount that by saying Tomlin won "with Cowher's team", but I would combat that with two facts: Cowher guided the Steelers to a very disappointing 8-8 record in his last season, and Tomlin had to win over a veteran locker room and establish new rules to a team that was very much set in its ways, an incredibly delicate task in the NFL. As for the ringleader of the circus, Ben Roethlisberger continued to run with the first team and supposedly will speak to the media soon, according to Tomlin. That can only be a good thing, because with each passing day his teammates will surely be annoyed with answering questions about his situation. Regarding their interim QBs, Byron Leftwich and Dennis Dixon split time with the second and third-teams, with Charlie Batch's role reduced to mostly a spectator. The Steelers have four more spring practices and will re-convene for training camp on July 30. Let's not forget he had the very whiny Alan Faneca to deal with as well.